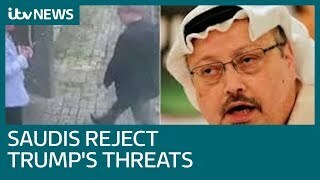 Saudi Arabia has rejected any “threats” of economic sanctions or political pressure after US President Donald Trump warned of punishments if proof emerges journalist Jamal Khashoggi has been killed. The statement carried by the state-run Saudi Press Agency on Sunday also warned the kingdom will respond to any steps taken against it. The words did not directly acknowledge Mr Khashoggi’s disappearance, which happened October 2 when he visited the Saudi Consulate in Istanbul.